The Kansas State Fair is nearly upon us once again… and after last year’s fun, of course I had to join in again! I’ve entered three items: some handspun yarn in the weaving category, and two women’s garments – the Paua Shell Tank and Lessa. The only problem is that I haven’t quite finished Lessa! After a seasonal hibernation (heavy sweaters tend to hibernate during the hottest summer weather – they are sometimes too warm a lapful, even in air conditioning), I got the red wool back out and finished the bottom, down to the curved hem. With the body almost finished, the sleeves were next. It took a couple of tries to get the sleeve decrease rates plotted to my satisfaction, but all seems to be going well now, and I’m down to the elbow on the right sleeve. There’s about a week and a half before the deadline for entries to be checked in, and I’m starting to wonder if I’m going to make it. 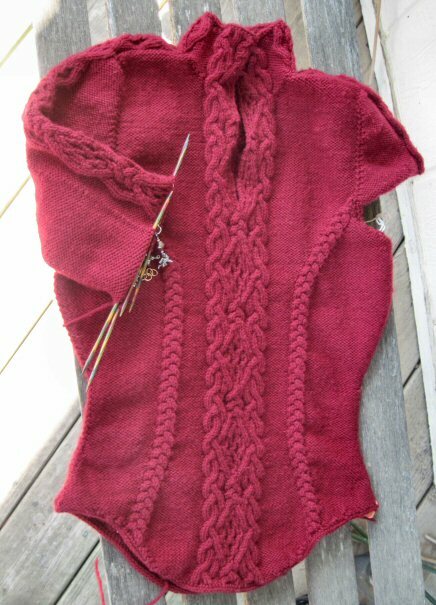 When I DO finish the sleeves, I need to rip out and redo the i-cord bind-off of the hem, using a larger needle for the curved sections between the princess-shaping cable and the main center cable. One of the things I love about seamless sweater construction is, since there is obviously no seaming to do, when I’m done knitting, the sweater is almost ready to wear! There will be a handful of yarn ends to weave in and finish off, a dragon button to sew on, then a nice wash and blocking. Actually, the wash and block will probably take at least a day off the available knitting time, since it’s densely knit and will take a long time to dry. It would sure be nice if I could do that NOW and then knit until the last minute if I needed to!! The sleeve-and-a-half doesn’t really sound like much ground to cover in 9 days or so, but I have to factor in full-time work, which usually ends up as 11 1/2 hour days when you count commute time. I keep trying to figure out how to knit while driving, but unless I can find a silent driver who doesn’t want to be paid, I think I’m out of luck there. And then there are things like cooking – oh, yeah, my microwave quit working last week – eating and laundry, and feeding a barn full of rabbits. Everyone seems to want to eat every day! Subtract sleeping time from what’s left, and you see that my knitting time has shrunk to a minimum. I do carry my project bag everywhere with me, and maybe a couple of times a week I’ll get some knitting in over lunch – but as busy as things are at work right now, that doesn’t happen as often as I’d like. So it will be kind of a slow-motion race to see if Lessa will get to go to the fair… stay tuned for the results! Thanks for the vote of confidence! Sleeve #1 is done, working on hem edging before I start on sleeve #2, so there is still hope. While I have cooked one real spaghetti meal, mostly it’s been Hamburger Helper & bacon/eggs/toaster waffle sort of things. And I dug out the whistling teakettle! Lessa is going to be gorgeous!!!! I do hope & do believe you’ll get it done in time.